'Hard Capture Is Complete': SpaceX Capsule Docks With International Space Station SpaceX's Crew Dragon capsule successfully docked with the International Space Station Sunday. SpaceX is demonstrating the potential for a company to carry astronauts into orbit. A SpaceX Falcon 9 rocket and Crew Dragon capsule lifts off from pad 39A on Saturday in Cape Canaveral, Fla.
"We can confirm hard capture is complete." Those words at 6:02 a.m. ET Sunday confirmed that SpaceX's Crew Dragon capsule had successfully attached itself to the International Space Station, about 27 hours after lifting off from NASA's Kennedy Space Center in Florida. Plans call for it to remain docked with the station for five days. On March 8, it will undock and re-enter the Earth's atmosphere, splashing down in the Atlantic Ocean around 8:45 a.m. ET. 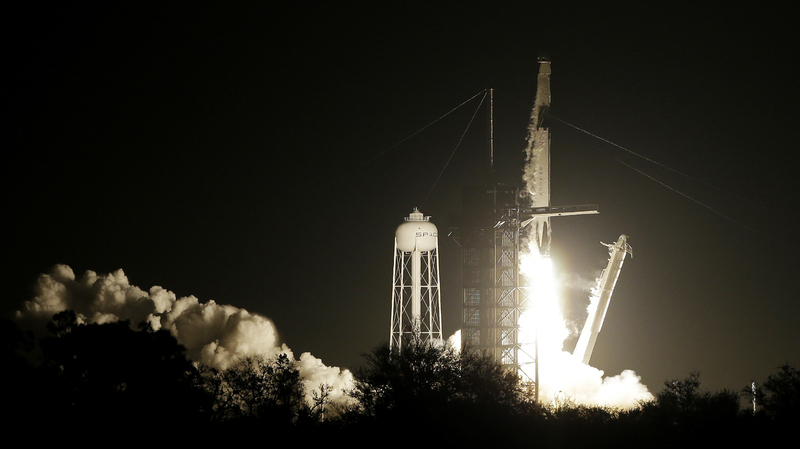 The company's Falcon 9 rocket and Crew Dragon capsule blasted off on schedule at 2:49 a.m. Saturday. The test flight is without crew aboard, designed to demonstrate the potential for carrying astronauts into orbit on a commercial spacecraft. The rocket and capsule separated about 11 minutes after launch. NASA has had to hitch rides with Russian space vehicles to get its astronauts to the space station since NASA retired the space shuttle program in 2011, reportedly paying about $82 million a seat. "Today's successful launch marks a new chapter in American excellence, getting us closer to once again flying American Astronauts on American rockets from American soil," NASA Administrator Jim Bridenstine wrote Saturday morning. "I proudly congratulate the SpaceX and NASA teams for this major milestone in our nation's space history," he added. "This first launch of a space system designed for humans built and operated by a commercial company through a public-private partnership is a revolutionary step on our path to get humans to the Moon, Mars and beyond." The Falcon 9 rocket booster landed on a droneship in the Atlantic at about 3 a.m. Saturday, SpaceX said, making it the 35th successful landing of one of the company's rocket boosters. The Crew Dragon is carrying about 400 pounds of supplies and equipment for the three astronauts aboard the International Space Station. Also aboard is Ripley, named after a certain fighter of an Alien. Ripley is no mere dummy, but "an anthropomorphic test device outfitted with sensors to gather important data about what an astronaut flying aboard the spacecraft would experience throughout the mission," NASA says. Anne McClain, the American aboard the space station, says she's looking forward to saying hello. If the rest of the SpaceX mission goes as planned, two astronauts, Bob Behnken and Doug Hurley, could be flying aboard the Crew Dragon as early as July, NPR's Nell Greenfieldboyce reported. SpaceX founder Elon Musk noted the accomplishment in a post-launch news conference with NASA officials Saturday morning. "I really believe in the future of space and I think it's important that we be ... out there among the stars. And I think that's one of the things that makes people excited about the future. That we want the things that are in science fiction novels and movies not to be science fiction forever, we want them to be real one day." NASA is also working with Boeing on a test flight of its Starliner capsule, also without a crew, scheduled for this year.